Charles Forrester. Monty’s Functional Doctrine: Combined Arms Doctrine in British 21st Army Group in Northwest Europe, 1944-45. Solihul, UK: Helion & Company, 2015. Pp. 226. The Foreword to the British Army’s 2011 doctrine primer suggested that doctrine was still viewed by many officers as a topic they would rather avoid. Indeed, for many people the mere notion of the conceptual component of fighting power, the thinking element of fighting doctrine, is both remote and difficult to comprehend. With that in mind, this book is likely to appeal to those who are fascinated by the interplay between conceptual doctrine and physical practice in the latter stages of the Second World War. Monty’s Functional Doctrine attempts to reconcile historiographical interpretations of the British Army’s methods and performance in the Anglo-Canadian 21 Army Group by means of an examination and an explanation of the way Montgomery incorporated best practice techniques, devised by lower and middle level commanders to produce a functional, workable and adaptive doctrine for integrated armour and infantry cooperation. The book, which builds on Forrester’s doctoral thesis, clearly articulates his enthusiasm for the intricacies of the subject as indicated in his writing style, which is encyclopaedically detailed. The benefit of Forrester’s methodical and rigourous approach is that the conclusions he draws are supported by the extensive use of references, many of which are primary sources. Forrester contends that agile, capable and adaptable mid-level commanders, under the mostly benign eye of an omniscient and supportive Montgomery, were empowered to think conceptually in order to create doctrine suitable for the terrain and environment facing them in Europe. I particularly liked the clear explanation of the evolution of the British Army’s thinking with regard to tanks and infantry in the 1930s, which led to the separate development of Infantry support tanks, Cruiser tanks and the motorised infantry. This background contextualises the problems encountered in integrating the infantry and the armoured forces in the later years of the war. I also enjoyed the explanation of the thinking necessary to overcome the initial inferiority of British tanks, guns and anti-tank guns in the wide expanses of the Western Desert: an environment which offered the opportunity to conduct tank battles in manoeuvre. Nevertheless, it was a surprise to find the author’s definition of doctrine (p. 192), fundamental to the understanding of the book, in the Appendix, which also articulates Forrester’s desire to debunk the perception of Montgomery as an authoritarian ‘top-down’ commander, unwilling to listen to, or incorporate, the experiences and ideas of those lower down the command chain. The description of the interplay necessary, between the commanders of the infantry and armoured divisions and brigades, to adapt infantry and armour tactics in order to overcome the enemy is well handled, as is Forrester’s explanation of the way the lessons from the fighting in North Africa were misread during the early stages of the campaign in Normandy. Forrester also shows how Montgomery dealt with flamboyant and impudent commanders who failed to follow his direction or embrace a culture where hierarchical centralised command and control also allowed and encouraged subordinates to improvise (p. 59). That said, in concentrating mostly on the interaction between infantry and armour, Forrester’s coverage of the doctrinal development and integration of artillery and air power is noticeably thin. One of the ideas to emerge from the growing body of literature, which seeks to rehabilitate the reputation of the British 21st Army Group, is that air power’s influence has been greatly overestimated. Some historians have claimed that the air interdiction plan did not significantly delay German reinforcements getting to Normandy; that the moral effect of air power was temporary and largely intangible and could even have been used by the defeated Germans as an excuse to assuage their humiliation at defeat; that the threat from Typhoon aircraft was ‘more myth than reality’ and that Gooderson’s belief in the ‘moral effect’ of airpower to carry the day is grossly overstated. This argument is far from won. While Jonathan Fennell acknowledges the revisionist arguments, he draws on work by King, to supplement his analysis to suggest that success or failure was dependent on morale. Certainly, in 1940 and 1941 British and Dominion soldiers viewed the loss of air superiority as a fundamental constituent of their defeats. Moreover, Fennell has shown, air power did induce feelings of vulnerability, which resulted in tangible morale effects out of all proportion to the physical effects. 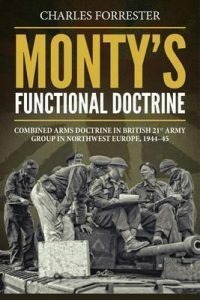 Monty’s Functional Doctrine investigates the development of doctrine and tactical practices of the 21st Army Group in a way that will interest both academics and those interested in the interplay between infantry, armour, artillery and air power during the latter stages of the Second World War. It is a worthy addition to the historiography that seeks to rehabilitate the reputation of the British Army in Normandy and beyond. One of the biggest things I took away after reading the book was that the story is only part told: that only when the moral effect of artillery and air power on the German defenders is fully incorporated into the narrative will we garner a truer picture of the performance of the 21st Army Group. After all fighting power, as British doctrine currently tells us, is a composite of the conceptual, physical and moral components. Army Doctrine Publication: Army Doctrine Primer (AC7194). (MOD: 2011), i. Air Vice-Marshal (Ret’d) Mike Harwood, “The Conceptual Component,” Air Power 2014/2015 Engaging in a Changing World (2014): 16-18. A summary of the key conclusions of Forrester’s thesis can also be found in his article: Charles Forrester, “Field Marshal Montgomery’s Role in the Creation of the British 21st Army Group’s Combined Arms Doctrine for the Final Assault on Germany,” Journal of Military History 78, no. 4 (October 2014). Ian Gooderson, Air Power at the Battlefront: Allied Close Air Support in Europe, 1943-1945 (London, UK: Routledge, 1998). Robert Vogel, “Tactical Air Power in Normandy: Some Thoughts on the Interdiction Plan,” Canadian Military History 3, no. 1 (1994): 37-8, 42, 45; Christopher Evans, “The Fighter Bomber in the Normandy Campaign: The Role of 83 Group,” Canadian Military History 8, no. 1: 21, 31; Terry Copp, “21st Army Group in Normandy Towards a New Balance Sheet,” Canadian Military History 16, no. 1 (2007): 65-67. Jonathan Fennell, “Reevaluating Combat Cohesion: The British Second Army in the Northwest Europe Campaign of the Second World War,” in Frontline: Combat and Cohesion in the Twenty-First Century, A. King (ed. ), 134-166; Anthony King, The Combat Soldier: Infantry Tactics and Cohesion in the Twentieth and Twenty-First Centuries (Oxford, UK: Oxford University Press, 2013), 36. TNA CAB 106/220, Final report of the Bartholomew Committee on lessons to be learnt from the operations in Flanders. Martin Francis, The Flyer (New York: Oxford University Press, 2008), 19-20; Air Historical Branch, RAF Campaign in Crete, May 1941, First Draft, 71-74; D.M. Davin, Official History of New Zealand in the Second World War 1939-1945: Crete (Wellington: Historical Publications Branch, 1953), 458; Henry Probert, Bomber Harris: His Life and Times (London: Greenhill Books, 2001), 120; David Stubbs, “Politics and Military Advice: Lessons from the Campaign in Greece 1941,” Air Power Review 17, no. 3 (2014): 117-118. Jonathan Fennell, Combat and Morale in the North African Campaign (Cambridge, UK: Cambridge University Press, 2011), 55, 60-63, 76-78. Joint Doctrine Publication 0-01, UK Defence Doctrine (November 2014): 25.